Bryant Johnson puts up a shot on Tuesday night versus Piqua. Quentin Glover makes a move to the basket on Tuesday versus Piqua. 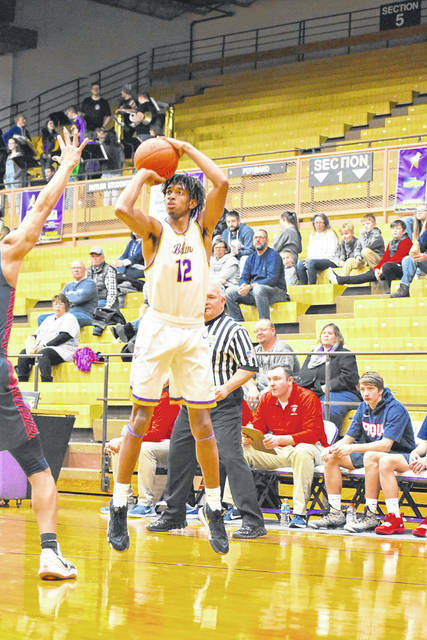 VANDALIA — Friday night’s boys basketball game between the visiting Piqua Indians and the Butler Aviators wasn’t your typical affair. A fire alarm prompted game officials to clear the SAC and end the junior varsity game with over 6 minutes remaining while fire officials made sure the building was safe. 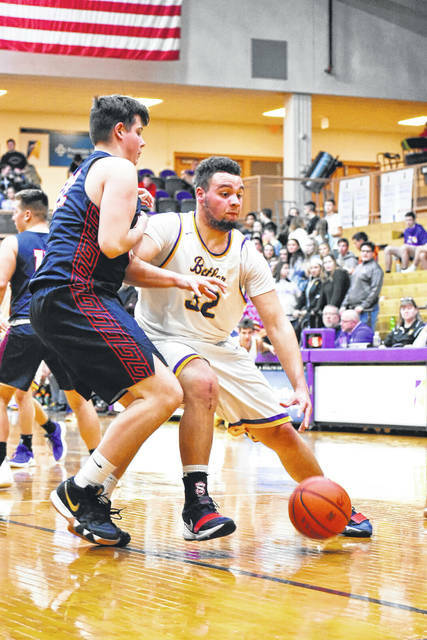 No fire was found, but if it had, the Butler Aviators could have provided the water after the Aviators hit 12 rainmakers from beyond the arc to spark a 72-49 win over the Indians. Braedon Norman, who set a career high in points for the second time this season, connected on six of the three-pointers to lead all scorers with 22 points. The win lifts the Aviators to 15-2 overall and 9-2 and in a first place tie with Sidney in the Greater Western Ohio Conference North division. Perhaps the loudest cheer of the night came when the fire alarm, complete with a loud buzzer and flashing lights, was finally shut off. The beginning of the game was delayed by about 7 minutes, and someone may have forgot to tell the Indians. Butler came out and Norman hit a three that prompted Piqua to call time just 1:13 into the game. Two more Norman threes and a basket by Michael Kreill later and Butler led 11-2. Piqua started heating up and rattled off a 10-0 run to claim a 12-11 lead. The lead exchanged hands twice more as the Aviators got a three from Tyler Montegue. Norman had one more in him and drained a three at the buzzer that gave Butler a 17-14 lead – one they would never surrender. Ryan Wertz joined the long-distance party in the second quarter with a pair of threes. Butler build their lead to as much as nine points in the quarter, but settled for a 34-27 lead at half. The Aviators won the third quarter as they have so often this season and despite not throwing a haymaker, it was clear the Indians’ chance at an upset were over. Norman and Wertz both connected from beyond the arc, and along with baskets by Kreill and Bryant Johnson, the Aviators led by as many as 15. Cooper Justice his a three-pointer to close the quarter. Butler steadily pulled away in the final quarter which was capped off by a three-pointer by Nick Lobianco to set the final score. Five different players scored from beyond the arc as the Aviators shot 12-of-28 from three, something Wyrick hopes bodes well for the future. Wertz was the only other Aviator in double figures with 13. Johnson had a fantastic all-around game with 9 points, 7 rebounds, 5 assists and 5 steals. Quentin Glover had 8 points, 5 rebounds, and 4 assists.